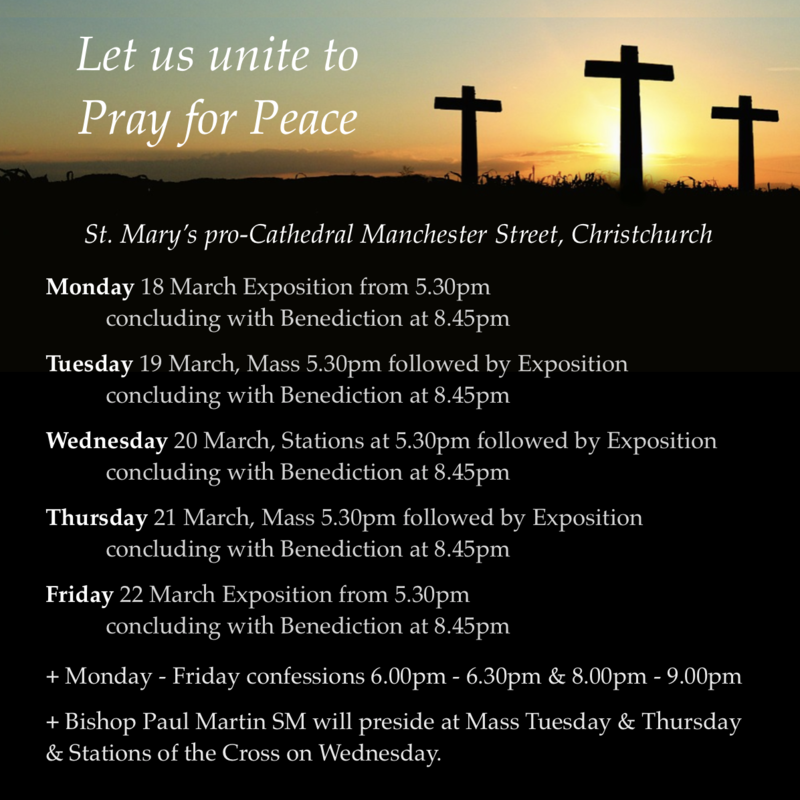 Each night this week the Christchurch pro-Cathedral of St. Mary is open for silent prayer before the Blessed Sacrament from 5.30pm concluding with Benediction at 8.45pm. Tonight’s gathering was deeply moving as only people praying in silence can be. When I entered the pro-Cathedral I was surprised by the number of young 30 – 50 year old men who had made the trip in from a nearby town, many of them fathers, taking time to pray in response to the suffering and loss that overwhelms our city in these days. We know that Mary pondered things in their heart, but so too would have St. Joseph, the father of Jesus. Tonight these men, these fathers were pondering the presence of God, and in conversation with them later it was clear that they knew they were doing the most important thing, building their relationship with their wives and children by taking time to ensure that their relationship with Jesus was vibrant and growing. I took the picture above a few years ago at Los Angeles Cathedral of Our Lady of the Angels. 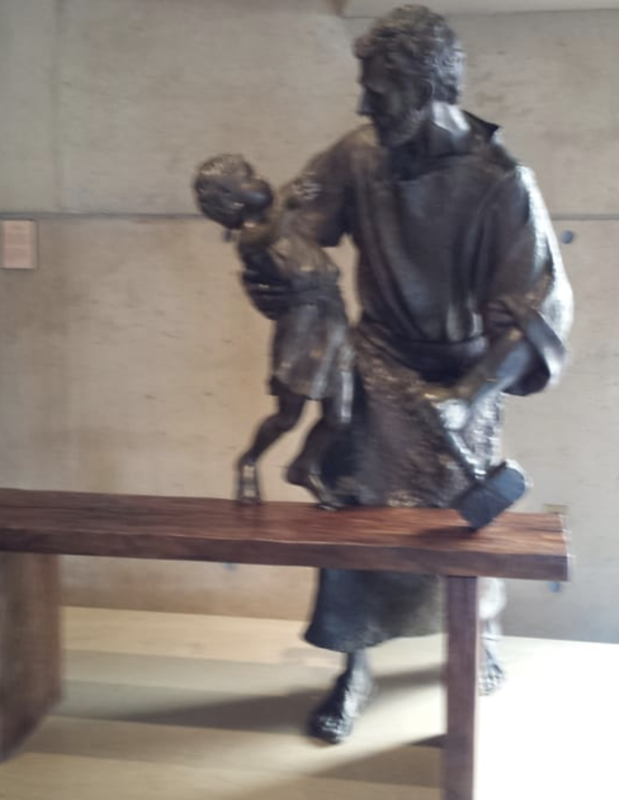 The carving is of St. Joseph with a young Jesus. It is a rare and powerful portrayal of a delightful moment in this father-son relationship. 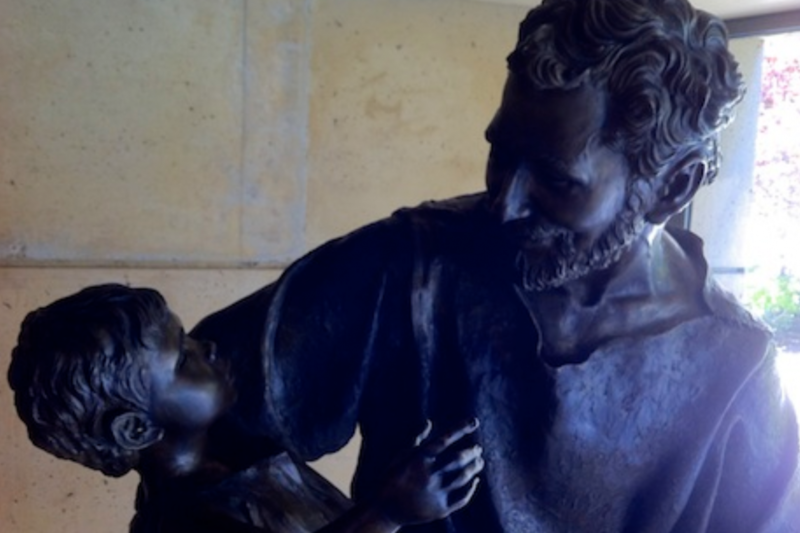 Today we celebrate the feast of St. Joseph, the father of Jesus. In Italy it’s also Father’s Day. The vocation of fatherhood was often seen simply and primarily in terms of ruling over and providing for the household. In recent decades we have moved to a healthier understanding of parenting as a shared responsibility of leadership and provision. The primary role of a father is to love. In the Office of Readings for this feast, the reading from St. Bernadine of Siena repeatedly highlights one central aspect of his life and mission: Joseph was the foster father of Jesus. I am thinking especially today of the many men who are loving (as fathers), children who are not their own biological offspring. Today, more men than ever are in this situation. There are many reasons for this reality. But how these men found themselves as foster fathers is not as important as the fact that they are now called by God to love, as fathers, their foster children. Some of these men are providing fatherly love to children who in earlier years were denied this love, or who tragically were mis-treated and unloved by their biological fathers. Many foster-fathers are replacing lost fathers, or sharing the role of fatherhood for perhaps a few hours or days each week. Whatever your situation as a father, today on the feast of St. Joseph the father of Jesus we celebrate your feast day. And today especially we pray for you. 6 Responses to "for fathers"
Many. Thanks John for your insight and reflection. A great prompt for prayer on this feast of St Joseph. In my earlier reflection this morning reading the second reading from Romans, I was reminded of a song my children learned at school many years ago. Thank you Father God for the loving generosity of our fathers here on earth. Thank you for this, John. I am married to a man who does a brilliant job of fathering three kids who are not biologically hos own and your words touch me deeply. I also really appreciate the detail photo of the statue in Los Angeles Cathedral. Thank you for your wonderful words also for Pope Francis reflections these are beautiful. Thankyou Fr John for your Lenten posts. I am praying for our brothers and sisters who lost their lives on Friday, that Our Father in heaven and Blessed Mother Mary will now be surrounding them with so much love. I pray for their loved ones too and also the badly injured. 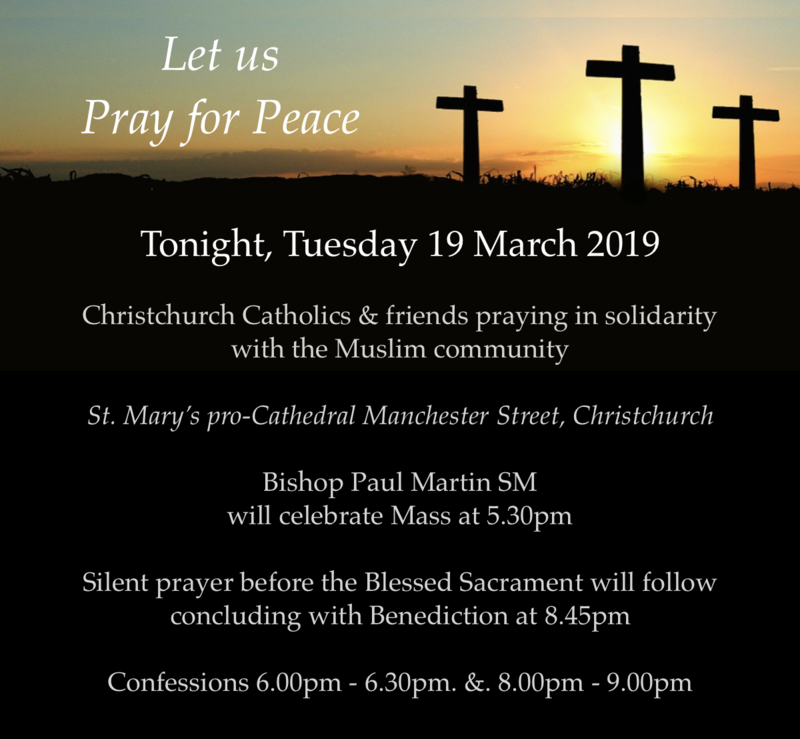 Thinking of and praying for all our brothers and sisters in all faiths. God is with us.